Well, I'm one of the new guys, Bowlda... but you can just call me Bowl if you prefer not typing the last two keys (you lazy thing!). I've been playing the awesomeness that is Spiral Knights for about a year and a half now so I guess I'd consider myself pretty experienced. Prior to joining Oathkeepers, myself and my two bro's (KingParat and Xroth) used to run a small guild called The Clockjerks. 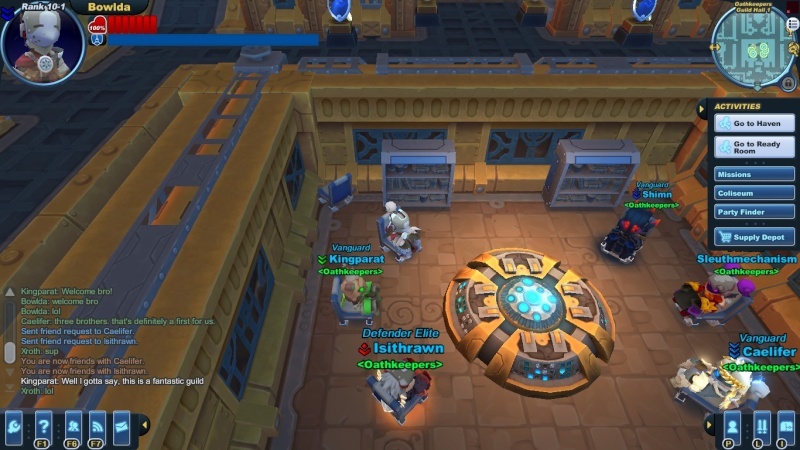 We put it into hibernation because we didn't have the time to manage it properly and we wanted to join a bigger Guild with more friendly players to have fun with. If you have Steam, feel free to add me (just search Bowlda) so we can chat and stuff. Other games I enjoy on Steam are TF2, Ace of Spades (occasionally), Portal, Garry's Mod, Half Life, (pretty much anything Valve) and anything that I like the look of really. Yeah well that's pretty much it, just wanted to say that I really like Oathkeepers and already; it is a very well run Guild and I have a lot of respect for Cael and the Officers who put so much time and effort into making sure it's a fun and awesome! Hello there. Bowlda, was it? I joke! Welcome to the forums! And yes, I'll be fully exercising the right to drop the last two letters of your name. I'll be seeing you in the hall real soon; and you know what they say- 6 billionth and one time's the charm. Also I have a few questions about rearing these specialised kangaroo mounts. We'll talk. G'day mate. I reckon they call those "kamotes" in your place, crikey! and welcome to oats, bowlda. good to have another aussie in the guild. so if ever, we have plans to take over the world, you and gold will be our australian "ambassadors"
Goldenfighter: Shhh, don't tell them that we actually have cars!! And Blurple, she's an Aussie too, though she is busy with school. Thats 3 of us then? Oh, and don't forget my 2 brothers Kingparat and Xroth. 5! Wow, we partically own this guild!